From the greatest!? guess who! FANS! To the 2nd greatest in the universe. A classic teenage ‘it’s all about me’ status update – even without the internet we still managed to display the arrogance of youth. Jackie and I vied with each other scrawling ‘I am the greatest!’ on anything and everything (which I had forgotten until I found this postcard!). This picture is of Dartington Hall, Totnes in Devon which was built in the late 1300’s Some 600 years later the Estate is home to a variety of arts and commercial activities as well as being a conference and wedding venue. The postmark date is Axminster, 7 June 1976 and the stamp is a second class 6½p for a small postcard, which approximates to 48p in 2014. Interesting to note that two years on from when post codes were supposed to be used on all correspondence, most of us still weren’t bothering. The cards and letters were delivered anyway and they were too complicated to remember. Jackie lived right next door to me at my new house, but I was put in a different class at the new junior school and became friends with Julia. Julia went to a different senior school. At my senior school I was put in a different class to my other junior friends and ended up being sat, alphabetically, next to Jackie. She became my new best friend. I found it all quite traumatic, it seemed to be several months of continually getting to know a new group of friends, the memory of which still causes me anxiety today. Then Jackie’s family moved away from the area – we exchanged letters and cards, as well as visiting each other in the holidays. Jackie’s letters dwindled and I got tired of trying to maintain the friendship, so I gave her an ultimatum – write more often, or don’t bother. Jackie stopped writing and we lost touch. This is regrettable and entirely the fault of my stupid and self-centred young teenage self. I am truly sorry for any hurt I caused Jackie. 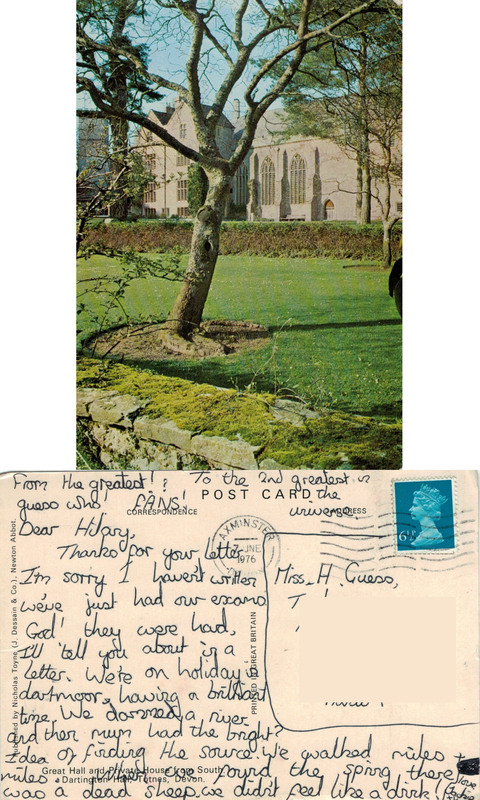 This entry was posted in Correspondence, History, Life Path and tagged arrogance, best friend, Dartmoor, holiday, loss, postcards, school, selfish, sorry, status updates, teenagers. Bookmark the permalink.